Canadian energy is regulated by the National Energy Board. The NEB is generally responsible for inter-provincial and international matters such as imports and exports of natural gas and oil, inter-provincial pipelines and power lines, and offshore drilling and energy exploration. Domestic production and distribution of energy is left in the hands of the individual provinces, who decide which laws and regulations will ultimately govern their energy sectors. Within each province, energy is regulated by provincial energy boards; however, regulation varies from province to province. Alberta has largely privatized its energy sector, while in Ontario the process is still ongoing, with unregulated prices for large customers and regulated prices for small customers. Other provinces like Manitoba and Quebec regulate energy distribution more strictly, with some provinces choosing to produce and distribute energy entirely on the provincial level through providers referred to as Crown Corporations. 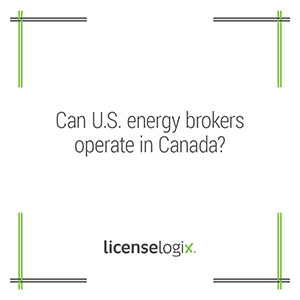 Becoming an energy broker can be a quick process or a complex one, depending on the province where you are want to operate. Most provincial energy boards require an application complete with personal financial statements, a security bond, and copies of marketing materials and contracts that your corporation will use. Application fees can range from $800 to $3000. Once you have submitted the appropriate application materials and fees, the licensing board will review your submission and will typically hold a hearing to approve or disapprove your request. The review process can take 90 days or more. LicenseLogix will help your business determine the licenses that are needed and obtain all of the licenses and registrations required, minimizing time-consuming and costly delays. To get a free quote, please can fill in the form on the right or give us a call at (800) 292-0909.